Yolŋu Radio is a community broadcasting station operated by ARDS Aboriginal Corporation. Why Warriors is partnering with Yolŋu Radio to broadcast educational programs. Broadcasting to all six major NE Arnhem Land communities and 15 remote homelands, as well as Darwin and Palmerston, Yolŋu Radio has a potential Yolŋu audience of up to 12,000 people and is one of the key community media sources for Aboriginal people in Arnhem Land. 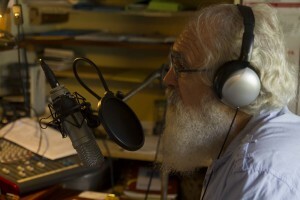 In many of the homelands Yolŋu Radio is the only media service freely available. As well as being the major platform for contemporary and traditional Yolŋu music, Yolŋu Radio is a critical source of news and information. ARDS/Yolŋu Radio regularly develops new programs on a range of topics including health and wellbeing, law, economics and many other subjects, in Yolŋu Matha and Plain English. Yolŋu miss out on essential information when it is delivered by mainstream services and spoken only in English. This has devastating impacts on nearly every aspect of their lives, and prevents them from participating in conversations and decisions that affect their families and communities. Why Warriors shares ARDS/Yolŋu Radio’s desire to address this information vacuum. We have produced audio programs in Yolŋu Matha to address topics that Yolŋu are desperate to understand, which we currently broadcast on-air and online in partnership with Yolŋu Radio. Why Warriors is also currently funded by The Department of Prime Minister and Cabinet to produce material around economics and to create a website and learning portal aimed specifically at Yolŋu, supporting them and providing meaningful and effective educational opportunities in a language they can understand. Why Warriors is proud to work in partnership with ARDS/Yolŋu Radio to broadcast this vital information to Yolŋu.